JMS was asked to provide marine engineering support to SENESCO Marine during the construction of new 117-foot 4,000 HP articulated tug-barge (ATB) units for Reinauer Transportation being built at their yard. In response to their request JMS placed an employee on-site at the yard in North Kingstown, RI over a period of four months to work hand-in-hand with their engineering team. Using computer drafting software on-site at SENESCO, JMS was able to assist in design of piping routes for several ship systems throughout the new ATB in a 3D environment. As work in the shipyard progressed, JMS was able to watch the computer piping models become reality as the actual pipes were being routed throughout the vessel. An added benefit to being on-site allowed JMS to troubleshoot with and assist pipe-fitters as their work continued. The University of Connecticut contacted JMS on behalf of Ocean Surveys Inc. to provide a solution for an upcoming expedition on the R/V Connecticut. The R/V Connecticut is 76′ steel vessel built in 1998 that conducts science missions throughout the northeast. During an upcoming cruise Ocean Surveys had a mission-specific task that required a vibratory core sampler to be lowered off the stern of the vessel. 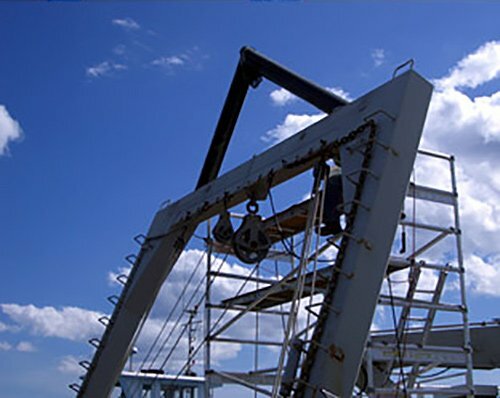 Due to the length of the core sampler, the present A-frame configuration was unable to lift the unit high enough to clear the deck edge at the vessel stern. 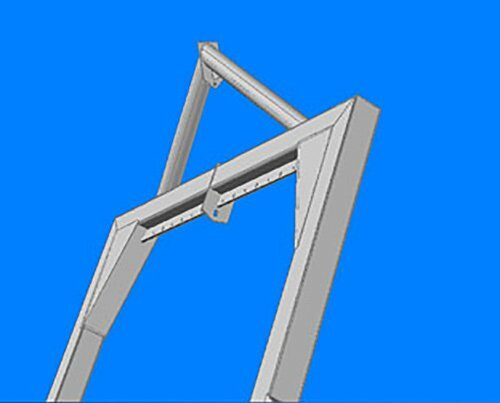 Utilizing existing vessel drawings as references, JMS designed an extension consisting of steel pipes at compounded angles to be welded on top of the existing A-frame. This would allow the core sampler to achieve the proper clearance from the vessel stern. JMS employed the use of three-dimensional drafting to model the complexities of geometry at different angles of deployment. 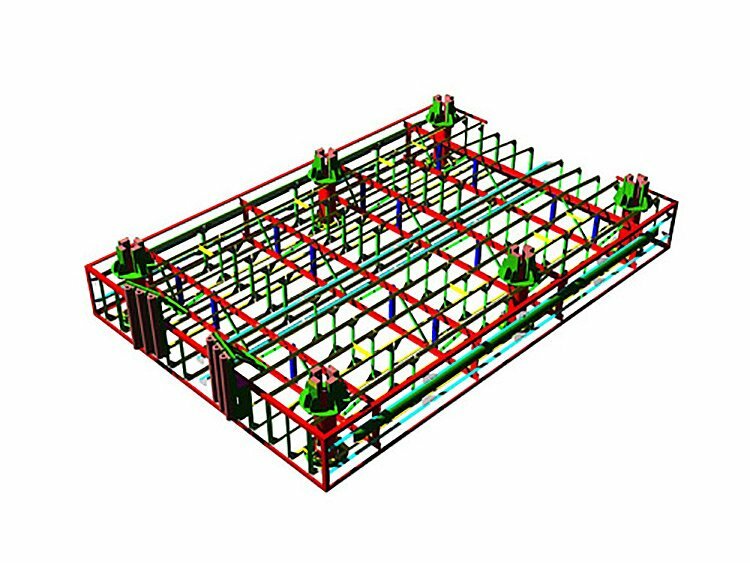 Using the developed model JMS was able to provide construction drawings to UCONN in a very short time span. JMS was able to engineer, design, and release drawings in time for the extension to be prefabricated and installed on the vessel during a one day load out and turnaround. Due in part to this prompt service the R/V Connecticut was able to get underway for the expedition and gather oceanographic data with no time lost. JMS was recently tasked to design two ferry landing barges. The barges will serve as an intermediary for passengers traveling between a ferry and the pier. The smaller of the two barges was constructed by Feeney Enterprises in Kingston, NY and the other is currently under construction at May Ship Repair in Staten Island, NY. Following construction, the barges will be located at the former Schaefer Brewery site in Brooklyn and Yonkers Main Street Pier, respectively. Both projects demonstrate the commitment JMS makes to its customers to provide complete marine engineering services by being involved in projects from conception to completion. The barges were designed by JMS in accordance with ABS rules for the inland waterways. Following the design phase JMS continued to support the projects during their construction by performing on-site inspections and offering engineering technical support.